Cybersecurity is not something that can be achieved through technology alone. The human factor is a critical component. Understanding the risks and employing strategies to minimize them is essential both in the workplace and at home. 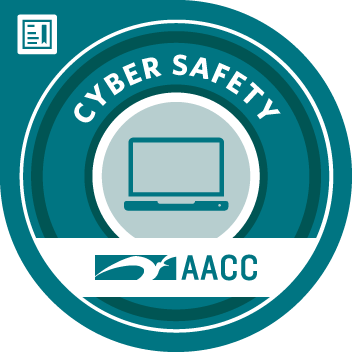 The Cyber Safety Badge is issued to students who demonstrate an understanding of Cybersecurity best practices such that they can implement them in personal and workplace settings. Student demonstrates knowledge of strategies used to keep accounts and data safe including the use of secure passwords and an understanding of two factor authentication. Student is able to identify the threats of social engineering and employ strategies used to avoid becoming a victim. Student demonstrates knowledge of mobile device security including strategies to decrease risks and an understanding of how the user's actions impact computer security. Student demonstrates understanding of the importance of online security by employing strategies to interact securely online in both personal and work environments. Student demonstrates an understanding of computer security and its importance including how to secure a computer and the ability to identify actions affect computer security. Student can identify the difference between open versus private Wi-Fi and demonstrate knowledge of how to secure Wi-Fi. Student can articulate what the "cloud" is and identify strategies to navigate it more securely. Student is able to demonstrate an understanding of actions that impact network security and related best practices. Student is able to distinguish physical and logical data. Student demonstrates an understanding of ways in which data integrity can be maintained and ways to safely destroy data. Student can identify actions that affect workplace security and best practices to make the workplace more secure.